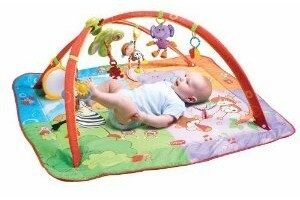 Tiny Love Move and Play Gymini: $50 w/ Free Shipping! Costs Over $61.00 Everywhere Else! You can get a Tiny Love Move and Play Gymini with Adjustable Arches for only $50 with free shipping on Amazon right now! I did some price checking, and the next lowest prices I was able to find was $63.98 at Walmart and $61 at Overstock! This would make a great gift for a mommy-to-be or a little one who's already here!